They have new poster children. Are they Israeli is yet to be known of course. If by chance they are not be sure to let me know. Click on Screen shots to enlarge. HAARETZ.COM News has obviously not been notified by Meir Panim as of yet. 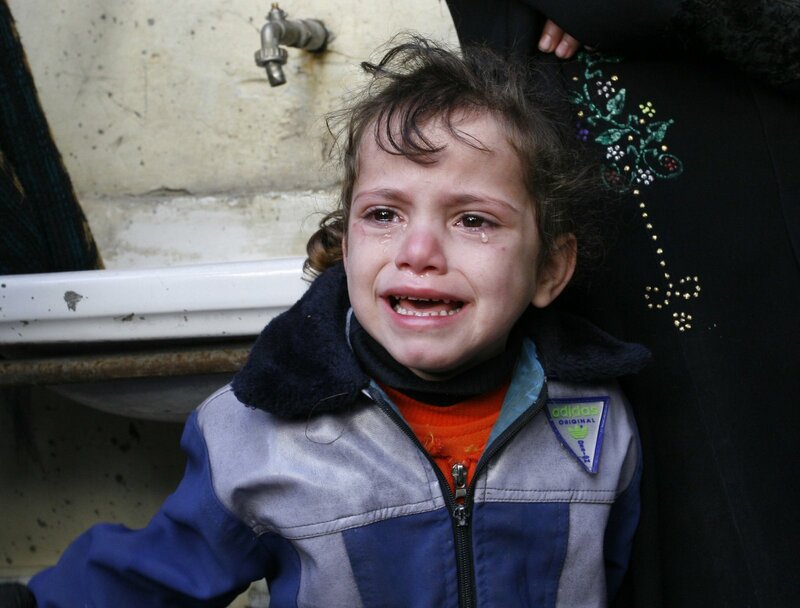 A Palestinian girl cries during the funeral of a relative that was killed in an Israeli air strike in Beit Lahiya, northern Gaza Strip, Sunday, Jan. 4, 2009. Israeli ground troops and tanks cut swaths through the Gaza Strip early Sunday, cutting the coastal territory into two and surrounding its biggest city as the new phase of a devastating offensive against Hamas gained momentum. "photo by Fady Adwan/propaimages"
For the first eight days of Israel's attack on the Gaza Strip, codenamed Operation Cast Lead, many Palestinians trapped inside the territory believed that living conditions could not get any worse. They were wrong. She is the same little girl in both pictures. This was discovered January 12 2010 and screen shots was taken so it could be proved, this child was the one being used as advertising for the Charity. One has to wonder how long they were using her photo? Both pictures used by the Charity were cropped, but if you look closely both have the Design on the clothing of the woman, who standing on her right, in her time of such tremendous, sorrow, considering she lost her brother an being surrounded by war. Just check the top right hand corner of the picture. Look for the green part of the design. The same by "photo by Fady Adwan/propaimages"of the little girl is also HERE as well third row down, third picture in. The first two screen shots can be enlarged by clicking on them. This Screen shot of the Charity site itself was also taken as well. Again the design is also in the top right hand corner. Also a of version of the larger "photo by Fady Adwan/propaimages"
Today the Charity Meir Panium removed the little Palestinians girls photo from its flyer. This of course I imagine after there were complaints about it's immoral use. There were thousands of people who saw this reprehensible use of this little girl to raise money for Starving children in Israel. Their new poster girl. Now is she really Israeli I wonder? If you see this little girls picture and she is from anywhere but Israel do let inquiring minds know. The ad is still on the HAARTZ site however. Seems the Charity has yet to contact them. So check to see if it is still there, it may or may not but if it is, you will see to the right of the picture of State Comptroller Micha Lindenstrauss. Then again in the past two days she has been most of their news stories. The ad has been removed from the HAARETZ site. Seems no one has seen an apology from either the Charity Meir Panim or HAARETZ. 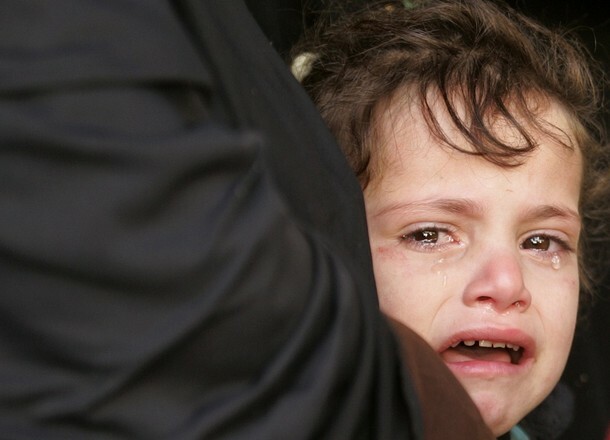 The children in Gaza are far worse off, then any child in Israel. If Israel has hungry men, women and children maybe they should spend less on weapons, checkpoints or imprisoning those from Gaza and the West Bank. The Building of the illegal wall could and should be stopped. The entire wall should be torn down. Those in Gaza do not have enough medical supplies, hydro, food, water heating fuel, cooking fuel and next to no building supplies and the list goes on an on. Many still live in tents. The things most people take for granted, they do not have. They are in desperate need of real help. That little Palestinian girl if she is still alive really does need help. She is an innocent little girl. Using her picture for profit to help those in Israel is beyond reprehensible. She and everyone in Gaza are desperately in need. Thank You to all who take the time to read this and those who took the time to do screen shots pictures and get copies of all the information pertaining to this horrid incident. Thank You to all the blogger's or those from forums and there are many for sharing this information. You will never see this on the main stream media. If not for others who took the time no one would know the crime against this innocent child. This is a crime. Even Charities have laws they must live by. Thank you all for caring. I know she is just one small little girl but we must be her voice, as her voice is so small. The children in Gaza don't get almost 3 billion dollars from the US every year. They don't get the millions Israel gets from Charities set up for them around the world. Just in a recent report the US has built buildings in Israel and I guess they need them for the $800 million in munitions Israel will also have access to as well. The US just gave it to them. Seems Israel if they have so many hungry should be given food not weapons. The US should stop giving weapons aid to Israel. If they are so desperately, hungry as they say they are, which I doubt, they do not in need more bullets, bombs, tanks, planes, etc. The UN and many others have demanded the blockade be lifted. Contact your Governments and tell them to have the Blockade in Gaza lifted. When people try to get aid into Gaza, they meet with a numerous problems. They WERE JUST THAT TICKED. I must express my disgust at whoever is responsible for putting together your Autumn flyer headed by the line "SHOCKING REPORT EXPOSES TERRIBLE REALITY FOR ISRAEL'S POOR." I will give you, who reads this note, the benefit of the doubt. You might really believe this is a starving little Jewish child. Not so. That traumatized child in the blue jacket is screaming because her family was just killed in front of her by the Israeli Military. This photo appeared on many sites during the Gazan Holocaust; they did a series of shots so there are a few of her at that time. I know it appeared on mine at some point. To see her pain now being used to raise money for Israel is just plain morally wrong. Poverty is poverty to a child, horrid to all, but this child is living in a squalor brought on by the Israel Army. Meanwhile Israel allows nothing into her country to improve her life. It seems just a wee bit bad taste to use her image in this fashion, I am sure you can only agree. This information is out there and you can bet the blogosphere is enlightening others of the nature of the Israelis. It would balance the scales somewhat if any monies raised by this child was donated to a Palestinian cause. JUST HOW LOW THEY GO. Freunde von Meir Panim e.V.